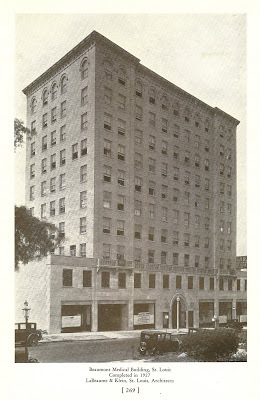 Not far from the Olympia, at 3716 Washington Avenue in Grand Center, stood the Beaumont Medical Building. It was built in 1927 and was designed by LaBeaume & Klein. 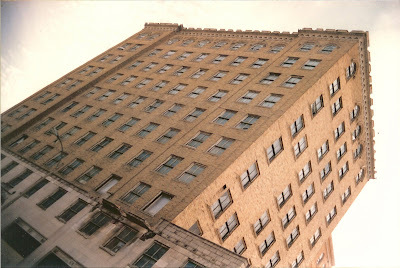 The Beaumont included a feature unusual for the time, an indoor parking garage in the building. The garage entrance can be seen in the photo below between two storefront windows on the left side of the building. Photo from "Missouri's Contribution to Architecture" published in 1928 by the St. Louis Architectural Club. 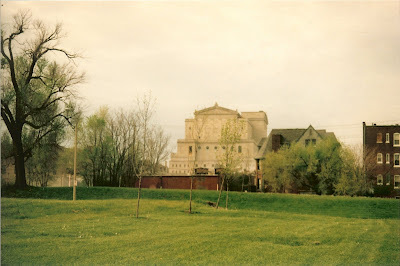 The sites of the Beaumont and the smaller building to the west are occupied today by the Pulitzer Foundation for the Arts and Contemporary Art Museum St. Louis. 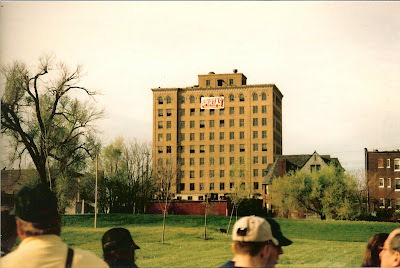 Both are great buildings and important ingredients in the revitalization of Grand Center. Both could have been built on vacant land or one of the many surface parking lots around the area, in fact an Ando exhibit several years ago at SLAM showed the original site for the Pulitzer on the site where Channel 9 built a few years later. 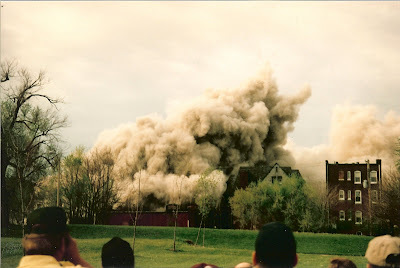 I was a student at SLU when the building was imploded, and I wandered over to check it out. 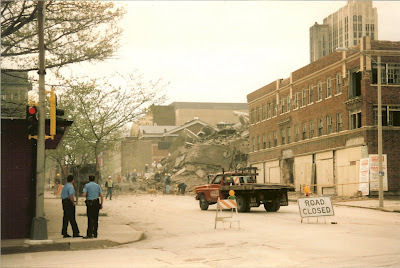 In retrospect, I wish I wouldn't have - we lost a great building that day. There's no doubt in my mind that had Grand Center mothballed the Beaumont, it would now be a great addition to the area, as the Continental is. There's no reason that the Pulitzer could not have been built elsewhere within the district. My overarching memory, however, is of the Coffee Shop in the building. My hometown had drug store fountain counters, but nothing nearly as crowded, smoky, and exciting as that coffee shop. Waitresses in uniform, clattering plates, waiting for a seat, and listening to conversations about city topics were all new to me. Sad to see it gone, but the part I liked best was gone long ago. Sorry this happened. My eye doctor was in this building and I remember going there and even as a grade school student an being impressed with this building.